Susan is a young professional who volunteers with Asphalt Garden, an organization dedicated to foraging for fruits, nuts, and vegetables that are donated to food banks and organizations to help the homeless and others that are food insecure. Susan's responsibilities include scouting available plants, documenting her findings, coordinating group picks, and assisting with the actual picking and cleaning of the fruits, nuts, and vegetables. Susan recently invested in a drone to aid her in her duties. After reading the instruction manual, she installed the standard drone app on her tablet. Although she could have used her smart phone as a controller, she decided to use the tablet because the larger screen would provide her with a better view of the streaming video and easier access to flight controls. In addition to setting up her tablet, she charged the drone's battery, placed it into the battery holder on the drone, and plugged her flash drive into the USB port on the drone. Then she placed the outdoor hull on her drone and connected the tablet to it through the WiFi signal emitted by the drone. Now her drone was ready to go. Susan chose to fly the drone at a difficult-to-access location. Last week, Susan had been walking through some park trails when she noticed what she thought might be a cluster of pear trees. However, the trees were on the other side of a small ravine, crossable only on a fallen tree. Certainly it would be possible to make the crossing, or there might be another way to reach the trees, but before doing so she wanted to make sure the effort would be worthwhile. This is where she returned today with her drone to do some remote scouting. She opened the drone app, pressed the take off button and launched the drone. Using the tilt-and-touch screen joystick controls she flew her drone across the ravine towards the possible pear trees. The drone was streaming video and she had a clear view of the remote scene on her tablet. Sure enough, she was right. They were pear trees, and the pears appeared to be in good condition. The battery level showed 67%, so she decided to fly the drone for a little bit longer. She dipped the drone closer to the ground, hoping to get a view into the ravine. But a bit of breeze blew the drone off-course, and she lost sight of the drone behind some bushes. Using the front-view camera she began to carefully raise the drone from the bushes. Something caught her eye, unsure of what it was, she used the drone to snap a photo. When she got the drone out from the bushes, she pressed the home button and the drone turned and began to fly to back to her. But the futzing with the bushes had drained the battery and just as the drone crossed the ravine, the battery level reached 5%, and the drone dropped to an emergency landing. Fortunately, it cleared the ravine. It was a bit scratched up but otherwise intact. Now that the drone was safely in her possession, Susan removed the USB drive attached to the drone and plugged it into her tablet to access the photo she had taken. She opened the photo in her photo app and zoomed in. She was right again - she thought she had seen berries on the bush, but the video was too grainy to be sure. Zooming in on the photo, however, she was able to clearly discern berries, blueberries, in fact. Her remote scouting was successful. She logged the trees and the bush in her notebook and left the park, heading home to add these new resources to the foraging database and map. Nina is a dedicated forager. She volunteers with Asphalt Garden to collect and distribute fruits to local communities in need. As an experiment, Asphalt Garden planted an urban orchard in a vacant lot with the goal of providing forage-able fruit for the neighborhood. Almost every weekend for the past year, Nina has walked to the garden to monitor the progress of the trees. But other commitments are now taking up Nina's time, and she is not able to go to the orchard every weekend. One of the other Asphalt Garden volunteers suggested to Nina that she could use a drone to help her monitor the urban orchard. So, Nina purchased a drone with an autopilot GPS unit. The next weekend, Nina took the new drone out for a test at the orchard. She plugged in the GPS unit and set the drone up for takeoff. On her tablet, Nina downloaded a map of the area. Her drone was marked on the map, and she clearly saw the urban orchard. Using the map interface Nina set eight waypoints around the perimeter of the orchard and 8 waypoints within the orchard to ensure that images of all of the trees would be captured by the camera on the drone. She pressed the takeoff button and the drone navigated the orchard, moving between the waypoints Nina set. After the drone had completed its flight, it returned back to its starting point. Nina returned home with the drone. Once at home, she set her back porch as the home base in the navigation software and then plotted a flight path from her back porch to the orchard (about a half-mile away), setting altitude points along the way so the drone would not collide with other buildings or power lines. Once it arrived at the garden it would fly the preset path around the orchard, recording video to an attached USB drive, and then return to her back porch. She then used the software to schedule the drone to make flights every Friday morning at 7am, as long as the weather forecast did not call for rain. The following Friday the drone began its weekly routine. By the time Nina had finished preparing for work, the drone would return and Nina would detach the USB drive and take it with her to work. There, on her lunch break, she would review the video from the morning flight. If there was issue-for instance, if the fruit looked to be in danger because of pests or disease or if trees had been poorly picked and damaged-Nina would know and would make a trip to the orchard a priority that weekend. In addition to being able to regularly monitor the urban orchard, Nina was also able to share the digital video and still images taken from the video with other members of Asphalt Garden. And as other members of Asphalt Garden began to use drones for similar purposes, they were able to collectively produce a rich media library of videos and photos documenting local urban growing conditions and results over time. Alicia, a forager with Asphalt Garden, is conducting a neighborhood fruit-scouting trip. The purpose of this trip is to find and document apple trees that have fruit and can be foraged. 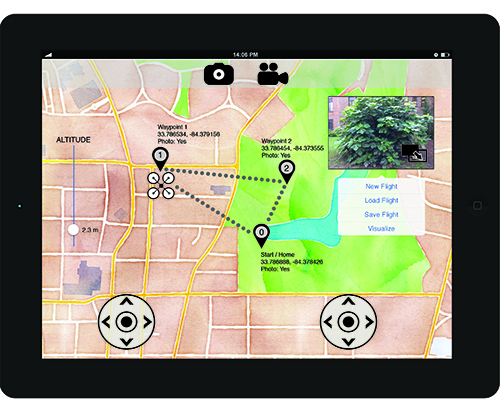 The locations then will be added as data points to a digital map maintained by Asphalt Garden. This map is publicly available and assists others in foraging fruit across the city. Alicia is not familiar with the neighborhood, and it spans many blocks and includes several small parks, so she will not be able to cover all of the neighborhood herself in the limited time she has. 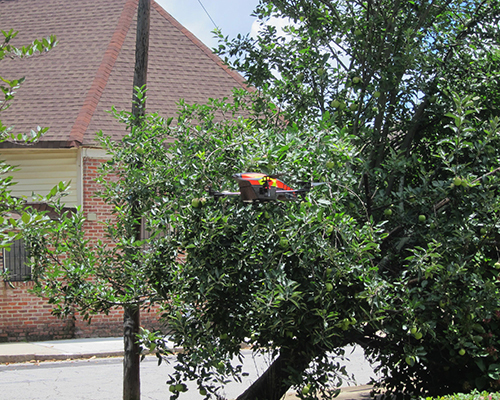 To solve this problem, Alicia is using a drone to help identify apple trees within the neighborhood. Based upon reviewing aerial photography from an online map and some tips from neighborhood residents, Alicia has a sense of where the apple trees are likely to be. She uses the drone mission planner software to setup 10 waypoints around the neighborhood, which she believes will give good views of the trees and hopefully help her discover new apple trees. She also sets up the imaging software to stream and analyze video footage from the drone, which will help detect fruit on the trees. Alicia sets the altitude for the drone in the mission planner and then launches the drone. It rises above the trees and sets off for the first waypoint. As it flies, she uses a tablet computer to watch the streaming video footage from the drone and monitor the mission. Half of the stream-view shows live footage while the other half shows the imaging filter that works to detect apple-shaped objects. At the third waypoint, Alicia notices something that looks like it may be an apple tree. She switches from auto-pilot mode to manual control and flies the drone closer. As the drone gets closer to the tree, the software analyzing the video stream detects apple-shaped objects. Sure enough, there is an apple tree she did not know about. The software counts the number of apples in view and averages the size of the apples, thereby providing an indicator of the tree's health (quite good) and when the apples might be ready to be picked (not for another month). She then marks the location of the tree in the software, backs the drone away from the tree, and resumes the auto-pilot to the next waypoint. As the battery runs low, Alicia returns to the drone to her home base. Although she only was able to make 7 of the 10 waypoints, over the course of the 20-minute flight she discovers eight new apples trees. 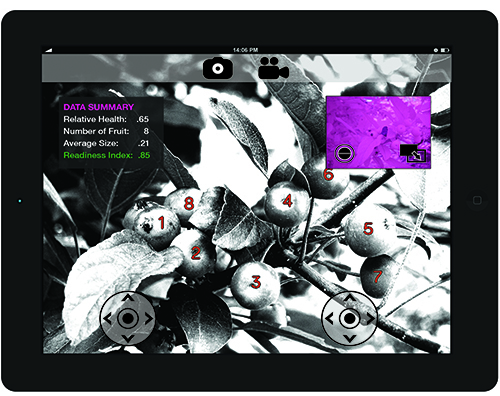 The location of each of these trees is stored locally on the tablet, along with an image of the tree, and the information gathered from the image analysis software. When Alicia returns home, she connects the tablet to her laptop, uploads the data to the Asphalt Garden digital map, and plans her next fruit-scouting trip.